In other words, of course, the ideal cocktail doesn’t exist. Thanks to the miracle of proper names, however, the Ideal Cocktail does exist. It’s not ideal but it’s definitely not bad. It did, though, require a bit of futzing with the proportions based on the somewhat vague instructions in the most reliable source for this early 20th century tipple, The Savoy Cocktail Book. I’m very okay with the rather stiff beverage I came up with based on Harry Craddock’s prohibition-era recipe, with just a little bit of bloggy help. 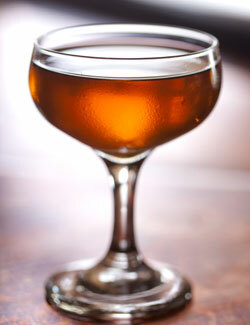 Combine the gin, vermouth, juice, and bittersweet cherry liqueur in a cocktail shaker and shake. Strain into a chilled cocktail glass. Toast the reality that, in all likelihood, there’ll never be an ideal anything. After all, if we all knew how to make the perfect cocktail, cook the perfect steak, make the perfect movie, or find the perfect love, life would either get really dull, or we’d all explode or something. Harry Craddock’s recipe is a bit vague by modern standards as it calls for 1 part vermouth to two parts gin, but specifically tells us to add a tablespoon of grapefruit juice regardless of how big our “parts” are. It also calls for an incredibly frustrating three dashes of maraschino, which can be anything. When first trying this drink out, I took my cue from Erik Ellestad’s 2009 post on his Savoy Stomp blog. He interpreted 3 dashes of maraschino to equal a teaspoon of the bittersweet cherry liqueur. He also — reasonably enough — called for 1 1/2 ounces of gin and 3/4 ounce of sweet vermouth, with him using the pricey (and admittedly fantastic) Carpano Antica. I liked his orthodox take on the drink which differs from the very few other versions of this you’ll find online. I chose my fall-back sweet vermouth, Noilly Pratt and started with Mr. Ellestad’s proportions, using a bottle of Tanqueray I’ve been itching to work with. I dismissed his suggestion to stir, not shake, the drink out of hand, however. Though I tend to be generally highly skeptical of the booze snob ban on stirring many cocktails for fear or spoiling the beauty and booziness of the drink, in this case most c-snobs actually have my back; conventional wisdom supports shaking any drink with citrus juice in it. I think it’s a necessity here. In fact, even vigorously shaken, the Ideal Cocktail came out a bit cloying to my tastebuds at those proportions. After experimenting with both Maraska and Luxardo brands maraschino, I decided that, this time, Luxardo was definitely the better choice, justifying it’s higher price tag. More importantly, I finally settled on upping the amounts of the Tanqueray and Noilly Pratt I was using. The results were bracing and just sweet enough, though I admit that it’s a pretty stiff drink. In an effort to make it a hair less stiff, I switched from the 94.6 proof Tanqueray to value price, 80 proof, Gordon’s. Not bad, if less than ideal. So, the first thing you’re likely to notice about today’s drink is that there’s nothing remotely Irish or St. Patrick’s Dayish about it. I admit it — I prepare these posts at least a week or so ahead, and it’s sometimes easy to get a bit mixed up about the calendar. Also, I have to admit, I don’t hang out in bars all that much — shocking, yes, I know — and, even if I did, the Irish community here in L.A. isn’t exactly as prominent as if I were in Boston or New Orleans or New York. You get a lot more reminders about the coming of Cinco de Mayo down here than St. Paddy’s Day. So, rather than trying to trump up a Irish connection that’s complete blarney, I’ll just straight up admit that this week’s really terrific drink is mostly Cuban in origin and comes to us from the promotional team behind a really outstanding pair of new rums with a pedigree that extends to the modern day heirs of no less than daiquiri drinker #1, Papa Hemingway himself. He was said to love a good daiquiri. If so, he would definitely have loved this one. Combine all the ingredients in a cocktail shaker. Maybe stir a bit to dissolve the sugar (not needed if you’re using C&H Superfine as I do). Shake and strain into a cocktail glass. Toast Papa Hemingway and all writers, including the less tortured ones. Now, folks, you should understand that when freebies greet me, I feel both grateful and slightly corrupted. Also, many times we get recipes that, while quite good, could actually work with any number of brands. Nevertheless, this little number really does seem to be expressly made to complement the qualities of the dang remarkable Papa Pilar’s Blonde. The combination of flavors from the grapefruit and maraschino liqueur in addition to the more traditional lime juice and sugar, really blends together with this uniquely flavorful blonde rum, which is delightfully heavy on notes of molasses and sports a bit of an oceanic twang. Honestly, unless you’ve got a similar blonde rum around (are there any?) 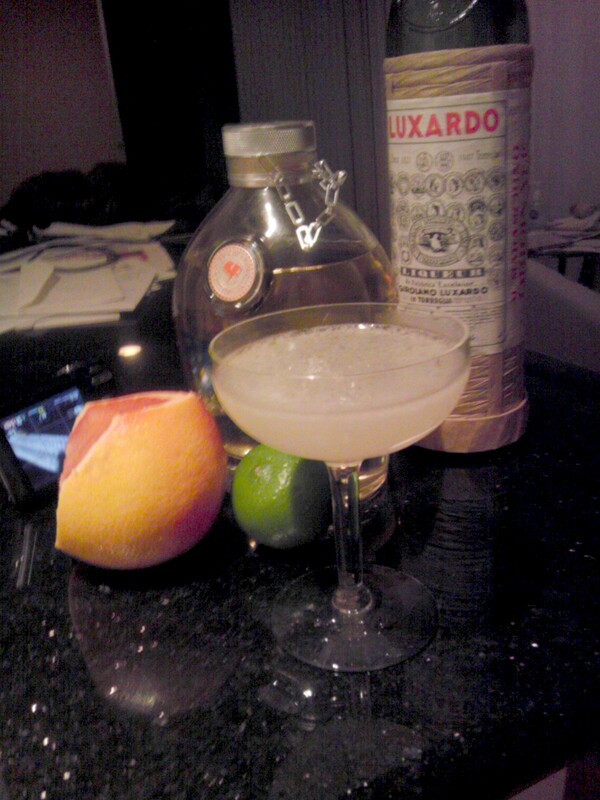 I’d stick with the simpler original daiquiri recipe I offered many moons ago. On the other hand, if you’re going to make the investment in Papa Pilar’s, and I certainly would encourage that, I demand you make this drink right away — and yeah, that includes shelling out extra for the maraschino liqueur. That one little teaspoon of slightly bitter cherry deliciousness is important, as I learned when I accidentally cut the proportion of in half while making a two PP daiquiris for myself and a very old friend who had stopped by. Cutting the amount from one teaspoon to merely 1/2 a teaspoon threw off the drink’s balance and the result was less balanced and very tart than I would prefer, though the friend was polite about it. Every drop of maraschino is sacred but, if you need to save money, you can go with the cheaper Maraska Maraschino and leave the Luxardo for fools like me who can’t resist luxy things. This is a drink you want to make right. It’s refreshing and nearly perfectly balanced bewteen sweet, tart, and the bittterness of the grapefruit. It’s A-1, even if I can’t try to fob it off as Papa O’Hemingway’s Irish Brew or what not. Have you ever really had the last word in an argument? Lord knows I haven’t….and it’s so very definitely not for a lack of words, or for a lack of arguing. Ask anyone who knows me well, I love to argue and I think it’s entirely possible to disagree without being disagreeable. In fact, I barely have to disagree with you at all to, nevertheless, disagree. You can have pretty much identical politics, taste in cultural matters, cocktails, and all the rest and I’ll still argue with you about something because life is simply too short to go around agreeing with everyone all the time. Still, no matter how important or silly the disagreement may be — or no matter how open-and-shut the case being argued — no one ever has the last word. Certainly not MSNBC host Lawrence O’Donnell of TV’s The Last Word, who I used to like a lot but who has gone off the deep end on odd subjects too many times for me to take too seriously. Nor even my beloved Rachel Maddow who, aside from having similar politics to my own (therefore making her a complete genius, naturally), also helped me get into this whole cocktail thing some years ago via the cocktail segments on her old Air America show. She ctually once made today’s drink on her TV show. Nevertheless, as I was reminded by the makers of the very drinkable No.3 London Dry Gin, we may never ever get the last word in an argument, but we can all have The Last Word, and all we really need are four ingredients. Combine the liquids in a cocktail shaker with plenty of ice. Shake with all the vigor of your Jack Daniels-guzzling right-wing uncle facing off against your pot-smoking auntie who drives the VW station wagon with thirty bumper stickers on it. Next, strain into a chilled cocktail glass. Toast the right to be as gloriously, insanely wrong in the eyes of others as you want to be. My cocktail books are still in boxes in DOTW’s enormous archives, but I can tell you that, according to Wikipedia and a few other odd blog posts, The Last Word was a pretty much forgotten prohibition era concoction until fairly recently. We are told that renowned Seattle bartender Murray Stenson singlehandedly revived the drink enough so that the rest of us could eventually hear about it. Now, the version we are making this week, promulgated by the makers of No. 3 London Dry Gin and Nevada mixologist Francesco Lafranconi, differs from the original only with some very specific choices of brands. Mr. Franconi suggests using No. 3 London Dry Gin, of course, and also specifically calls for Luxardo Maraschino liqueur, which is more or less the standard choice, but not the only one. More about that in a second. If you want a really lively and complex, you might even say complicated, beverage, then the Lafranconi version of this drink is definitely one good way to go. For whatever reasons the No. 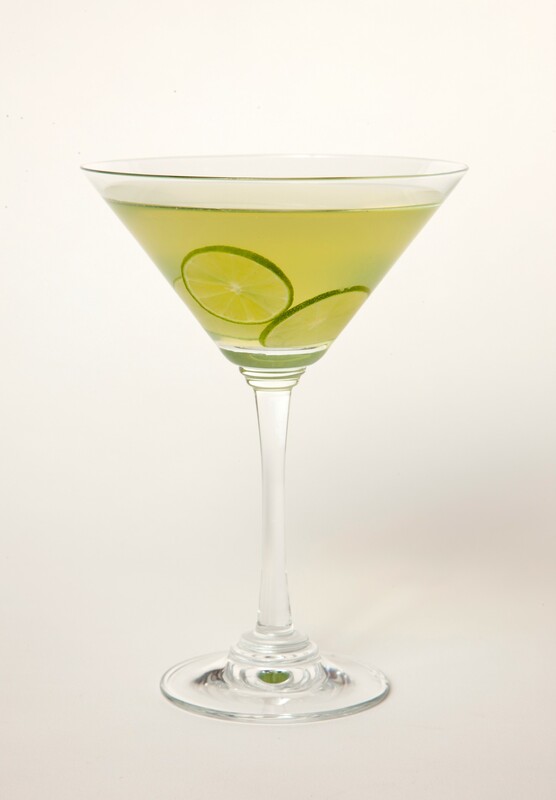 3 gin and Luxardo allow the strong herbal flavors of the chartreuse to become bolder than usual, possibly because today’s featured gin has some pretty bold citrus-peel bouquet and flavor of its own. We are told that the original version of The Last Word used bathtub gin, which we imagine must have had some fairly bold aspects of its own, but probably not the tasty and aromatic No. 3 kind. I have to admit I couldn’t resist also trying The Last Word with a very good Brand X dry gin and Maraska Maraschino, which is nearly as tasty as Luxardo but a lot cheaper. It has a slightly simpler appeal and it’s mouth feel is a bit less rich, but it’s quite good. That less uptown version of The Last Word was milder, a bit more muted. Very decent but not quite the ultimate version of the drink. Then again, I would never expect to have the last word on The Last Word. 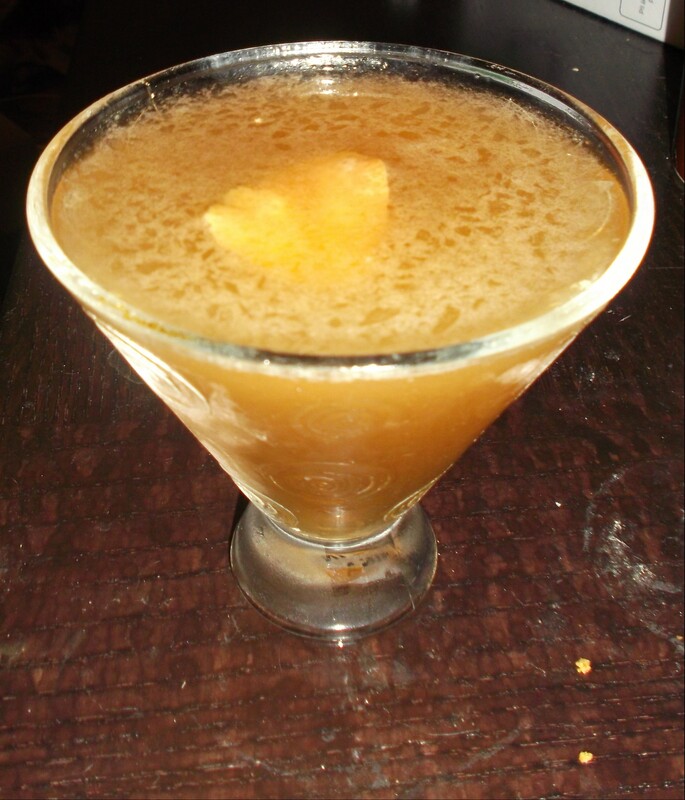 Last week’s DOTW was based on Dale DeGroff’s recipe which, in turn, seems to be largely drawn from Harry Craddock’s ultra-old school The Savoy Cocktail Book. Both of those recipes start with Canadian Club whiskey for the base spirit and use miniscule amounts of Amer Picon and maraschino liqueur. Part of the problem may be that only the maraschino appears to be much the same today as it was back in 1930 when Craddock’s book came out. I have great affection for Canadian Club but, like all the big corporate boozes, it seems, its recipe has changed slightly over the decades. I know this for a fact because my late mother — no boozer, but a very good hostess — had some 1980s CC at her place which had been neglected by her guests but which I eventually polished off only a couple of years back while she was in the hospital. As I was grateful to note during that difficult time, 1980s vintage Canadian Club was at least 3% more soothing than today’s Canadian Club, in that it was 86 proof, not the 80 proof version you’ll find now. It’s possible that was the version Mr. DeGroff was used to, and it might have worked better. Who knows what the stuff Harry Craddock was using might have done for the drink. Amer Picon as noted last week, doesn’t really exist at all these days, here or in Europe — unless you make your own. More about the many possible substitutions after the recipe. Today’s version of the Brooklyn is my take on a number of online recipes I found. They all begin with rye whiskey as the main ingredient and contain significantly larger proportions of the maraschino and Amer Picon substitute — 1/4 ounce might not seem like very much, but it’s a lot more than last week’s 1/4 teaspoon. Anyhow, I like this version quite a bit, even if I suspect it could be even better still. Yes, this week is a tale of many brands and making do with second best. For starters, I talked last week about the sudden appearance of Noilly Pratt “Extra Dry,” the temporarily discarded and probably inferior Americanization of the classic French brand. It turns out my beloved Noilly Pratt “Original Dry” is no longer being stocked by BevMo in these parts, so I made do with Martini & Rossi’s Extra Dry, which I think I somewhat prefer to the simplified Noilly. Moving on, I started out making this week’s drink with the contemporary standard for maraschino liqueur, Luxardo, but the beverage mysteriously evaporated and I had to get some more. It’s a very old brand but, since I had a hard time finding it my local BevMo and I felt like saving ten bucks, I decided to go with it’s best known competitor, Maraska. On it’s own, its a nice but less delicious liqueur than Luxardo’s maraschino, but it worked very well in the context of the Brooklyn. Cavaretta’s Italian Deli in Canoga Park — which doesn’t even stock liquor — I was unable to find a bottle of either product in time for this post. There seems to be something of a temporary Amaro drought here in SoCal land. Well, I’m trying to forgive and forget and find more reasons to drive out to West L.A. or Northridge. At least I happen to dig Bulleit’s new rye and the results with it were, on the whole, very good. I think I’ll continue to purchase it at Trader Joe’s, where it’s cheaper and I’m less annoyed.